Road trips rule in our household. The only problem is we don’t take nearly enough of them. Years ago, my husband and I thought nothing of picking a destination, hopping in the car, and setting out on an incredible journey. We didn’t really have much of a plan, we just ambled along, stopped where and when we felt like it, and explored. 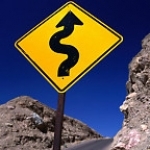 We used to say that the curvy road sign was “our” sign. And it still is. But many things have whittled away at our ability to road trip freely — but have done little to quench the “highway companion” spirit we share, and which our son has inherited. After seeing a small photograph of Devil’s Postpile in Mammoth, California, in AAA’s Westways Magazine a couple of months ago, I mentioned I’d never been there. My husband said, “Let’s go! That can be my Father’s Day gift.” Perhaps it was an offhand comment, but within a few weeks, we had cobbled together a trip and a budget and marked the calendar — we had 48 hours to travel into the Eastern Sierras and back again. Who knew what adventures we’d have along the way? It turned out to be a spectacular trip in every sense of the word — a true road trip, into the middle of no where, into wilderness, following rabbit trails as we pleased, and cramming a huge amount of activity into an amazingly small compartment of time. We all agreed it felt as though we had been gone much longer than two days and none of us was ready to come back home. Two things made the trip fantastic — the beauty of nature that surrounded us, and the much-needed time together as a family, just the three of us. It was truly a nourishing time, for the body, mind, and spirit. Grab a cup of coffee or tea and enjoy the virtual beauty break! Our first stop was at the Ranger Station at the Mt. Whitney portal, just south of Lone Pine. (On a personal note, my father-in-law is legendary for doing Whitney in one day!) It’s so interesting to drive through miles of desert, only to enter into the amazing juxtaposition of the jagged glacier covered peaks of the Sierras, the vast desert scrub (so eerily close to Death Valley), lush trees and grass, and flowing streams and rivers that make up the Owens Valley. If the ocean were closer, this place would truly be like heaven on earth. 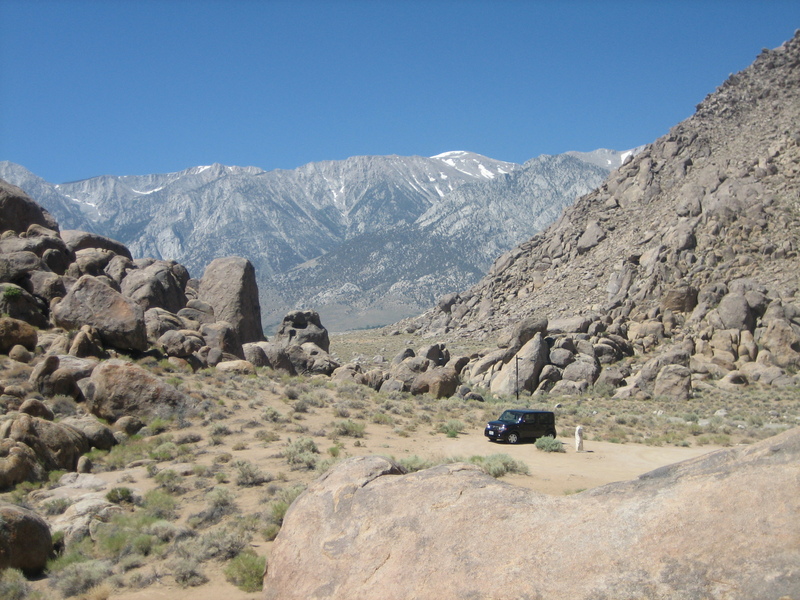 We’re big classic and Western film buffs, so of course we had to do some exploring in the Alabama Hills, just behind the little town of Lone Pine. Hollywood has used these hills, canyons, and valleys to film hundreds of movies over the last 75+ years. We were lucky enough to find the “California Historical Site” of the filming of Gunga Din, one of my favorite films starring Cary Grant. The hills are amazing because they can “look” like many different world locations, like India for Gunga Din or the Middle East for Ironman I. In the total isolation and silence, its easy to imagine the clatter of horses hooves carrying an unsuspecting gunman towards the dangerous Indian ambush lurking around the next rock. Our primary destination was Devil’s Postpile National Monument in Mammoth Lakes, California. Yes, that is snow you see behind us — in JULY in CALIFORNIA! The ski runs were open until the end of June. Crazy, and very cool. And, of course, homeschooling happens all the time, even on vacation. Skippy got lots of practice with geography, map skills, history, nature study, geology, and climate while we were away. The postpile is really something to see — totally amazing rock configurations and unique formations, perfectly formed by volcanic activity. Apparently, the formation is one of the finest examples of columnar basalt in the world. There was a time when the monument was threatened. A developer wanted to blast the area and use the basalt stone as rocks for a dam project; however, the naturalist John Muir and a prominent U.C. Berkeley geologist intervened and were able to save the site. Being an admirer of bees and a nature lover in general, I was fascinated by the hexagonal “honeycomb” shapes of the rocks. Probably my favorite part of the formation is the curved extrusions on the left side of the wall — this reinforces the reality that at one time the molten rock was pushed, almost like Playdoh through a Fuzzy Pumper Barber Shop extruder, into these finely formed shapes. After viewing the postpile, we felt like pushing on ahead down the trail to Rainbow Falls……not part of the original plan, but we were just enjoying the day and the beauty of being outdoors in such fresh air. The river that had meandered alongside us the entire hike dropped off the sheer cliff face of a huge granite gorge. No words express the beauty and grandeur of this place. It was the high point of the hike. The pictures speak for themselves.